The main event featured something you never want to hear in a championship fight. The crowd booed; scattered boos at first starting in the third round becoming a loud and lusty chorus of disdain and catcalls by the end of the fifth. 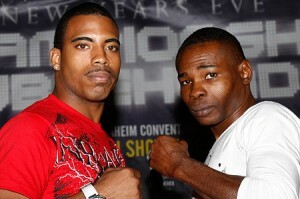 Rigondeaux, the Cuban, was content to box on the outside, pawing with his jab and occasionally throwing the straight left hand from the southpaw stance, while Rico Ramos fought less like a champion and more like someone who was legitimately afraid of his opponent after the challenger dropped him in the first round with one of those left hands. Indeed, it looked like it was going to be a low-action cruise for Rigondeaux until, in round six, he caught Ramos with an uppercut while clearly holding him behind the head. Referee Joe Cortez did not give Ramos any time to recover from the foul, even though the champion was clearly hurt by the illegal punch. When Cortez called time in, Rigondeaux seized the opportunity and finished the job with a barrage of punches that put Ramos down for the ten count; while the knockout was a spectacular finish to an otherwise boring fight, the fact remains that it was facilitated by an illegal punch and a frankly amateurish performance by a so-called Hall of Fame referee. Hang your head in shame, Joe Cortez. That’s two fights in four months that you’ve screwed up. The undercard was a blast to watch and fans should be happy that Showtime decided to make this a triple-header. 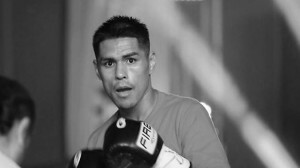 Matthew Villanueva cemented his position as a genuine, honest-to-gods prospect at 115 pounds with a performance that showed power, conditioning, ring generalship, intimidation, an all-action style–everything fans should look for in a fighter. 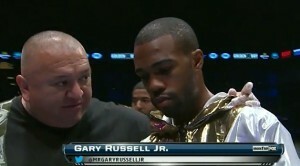 Michael Ruiz Jr. was in over his head and that became painfully apparent almost from the opening bell. Villanueva dropped Ruiz in the second round, kept the pressure up throughout the fight, and was rewarded by referee Russell Mora with a stoppage in the seventh. This was Villanueva’s first fight against anyone with even a halfway decent record and he passed the test with flying colors, dominating on national television on only a week’s notice. 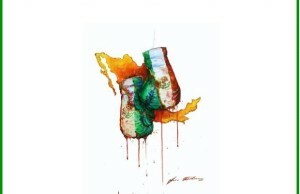 This also proved that he can go more than three rounds (his previous longest fight, a technical draw due to an accidental headbutt in his last fight), which augurs well for his future as more than just a knockout artist, should a fighter with a strong chin give him rounds down the road. In the second undercard fight, Guy Robb and Joel Diaz gave us a back-and-forth thriller that featured Showtime’s commentators (Al Bernstein, Steve Farhood, and super middleweight champ Andre Ward) asking the question “well, whose turn is it to get hurt this round?” Robb dropped Diaz in the second, Diaz dropped Robb twice in the fourth, and both men were on the defensive and on the attack in equal, alternating (and occasionally simultaneous) measure. This fight turned into two young guys just throwing bombs at each other, and it was a shame to see it end when referee Vic Drakulich stepped in for a quick hook in the seventh with Guy Robb on the ropes. The commentators correctly pointed out that Robb had earned the right to fight his way out of that situation, but tellingly Robb gave little argument when Drakulich stepped in front of him to wave the fight off. A title changed hands, a potential star was born in the opener, and the middle fight gave fans a slugfest. Can’t ask for much more than that from a night of boxing. Kudos to Showtime and the matchmakers at Goossen Tutor Promotions for putting on a show to remember; when boxing gets it right, it is very sweet indeed. Next week, your friendly neighborhood commentator is back on his regular beat covering ESPN’s weekly Friday Night Fights show; stay tuned to The Boxing Tribune for a complete preview and recap of that event. Fox Doucette covers Friday Night Fights for The Boxing Tribune. His weekly column, The Southpaw, appears on Thursdays. Subscribe to the Greatest Show in Social Media at facebook.com/MysteryShipRadio. Fan mail, hate mail, and fair-but-firm agreement that Joe Cortez should not be reffing title fights can be sent to beatcap@gmail.com.